nuun is introducing Performance, billed as ‘the cleanest endurance drink mix formulated from science and rooted in nature, designed for sustained and intense activities’. The nuun team partnered with world-renowned Exercise Physiologist and Sports Nutritionist Stacy Sims, PhD to use the latest understanding of how athletes’ systems react under stress. The aim was to create a hydration product that is lighter and yet more effective than what has been available. Pure ingredients and Non-GMO Project Verified sourcing contribute to the ‘absorption and minimized gastric impact’. Performance will be debuted at nuun’s expo presence at the Boston Marathon on 13-16 April and Sea Otter Classic on 20-23 April; and will begin being served on course at events this summer. A release from nuun notes that recent nutrition science has focused on how to aid the body to more effectively absorb fluids, carbohydrates and electrolytes during intense, longer duration exercise where stomach function is compromised… ‘Traditional sports drinks contain excess sugars, ‘fillers’, and other ingredients that are detrimental to performance.’ Nuun Performance was formulated with a ‘ratio of multiple sources of clean carbohydrates and electrolytes your body needs to maximally absorb what you are consuming during activity’. 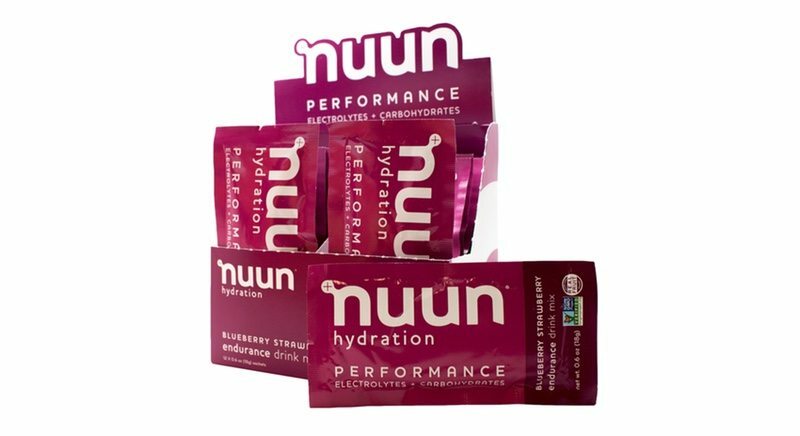 nuun adds that Performance is the only product to use multiple non-GMO sugar sources, dextrose and sucrose. The combination activates multiple absorption pathways and can eliminate the build-up of gastric distress. A fifth electrolyte, chloride, has also been added through potassium chloride given its rapid assimilation into the body. Chloride plays a key role in hydration at the cellular level and is needed for the absorption of fluid during prolonged activity. The new Performance line will be served on course at nuun sponsored marathons and cycling events over the next year including Seattle to Portland, San Francisco Marathon, the Aids Lifecycle Ride, Long Beach Marathon, NYC Century and Austin Marathon. nuun Performance is debuting with two flavours – Mango Orange and Blueberry Strawberry. It will be sold in a 16-serving pouch for US$19.99 and single serve sachets for US$1.99. The line will be available in April across sports specialty retailers including REI, Performance Bike and Fleet Feet.